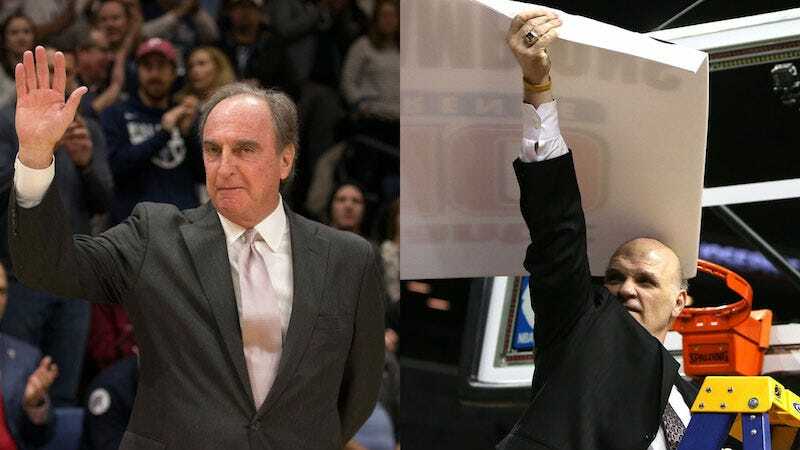 There was something appropriate about Fran Dunphy and Phil Martelli exiting the scene on the same day. Dunphy’s “retirement” as Temple’s head coach had been announced in advance; his final season with the Owls ended with last night’s First Four loss to Belmont. Hours earlier, Saint Joseph’s surprisingly axed Martelli. Let’s put aside the question of whether either coach deserved to lose his job, which is something for the message boards to fight about. Dunphy and Martelli were the last direct threads to Philadelphia’s unique tapestry as a truly localized basketball community. By accident of circumstance, their mutual departures bring an end to an era that has slowly ceased to exist. The Big 5—La Salle, Penn, Saint Joseph’s, Temple, Villanova—plus Drexel is steeped in tradition, as anyone who’s so much as sniffed the air at the Palestra during a city game will be quick to remind you. The city schools have done an admirable job of maintaining what was—bringing back the in-season round-robin; recognizing a champion and parceling out awards, including a Hall of Fame; talking up the historical significance of it all—even as the nationalized pressures of modern college sports have worked to sever the strands that bind them together. Both Dunphy and Martelli were raised in the Philly suburbs, where they were captivated at an early age by the Big 5’s mystique. They both arrived as Big 5 assistant coaches in 1985—Dunphy at La Salle, Martelli at Saint Joe’s. At the time, the Philly basketball ecosystem was still largely self-contained. It was a time when one of college basketball’s all-time great scorers, Lionel Simmons, could still fly completely under the national radar before landing at a tiny school like La Salle. But then, in pursuit of more revenue—a harbinger of things to come—the city schools began to host city games in their own buildings, rather than at the Palestra. For a time, the round-robin format was abandoned, only to be brought back. But the ecosystem was beginning to show cracks. Dunphy became the head coach at Penn in 1989; across 17 seasons, he won nine Ivy League titles. He only left for Temple after John Chaney retired in 2006. Chaney had guided the Owls to the Elite Eight five times, and even though his teams missed the NCAA tournament in each of his last five seasons, he left enough of a foundation to offer Dunphy the promise of great heights. Martelli took over at Saint Joe’s in 1995; by his second season, he had the Hawks in the Sweet 16. By 2004, led by Jameer Nelson—a local prodigy from nearby Chester, Pa.—Saint Joe’s would have one of the most extraordinary seasons imaginable for a school of its size: an unbeaten regular season followed by a deep tournament run that was short-circuited with the Final Four hanging in the balance by a John Lucas III jump shot. Within the ecosystem, all seemed to be right with the world. Dunphy and Martelli never achieved what seemed possible, but in recent years both had to overcome immense obstacles that were entirely unforeseen. The musical chairs of conference realignment, which went full-tilt at the dawn of this decade, may have triggered the final crack-up. Temple made a push to re-join the Big East for football—and the gargantuan revenues it promised—just as the Old Big East was imploding. By the time the music stopped, the Owls wound up in a league filled with outpost programs like Tulsa and SMU, which robbed them of their identity (and some attendance). Dunphy got Temple into the NCAA tournament six times in his first seven seasons, then just twice in the last six years. With the Owls, he only won two of his 10 tournament games. Penn’s Steve Donahue and La Salle’s Ashley Howard have deep local roots, but they’re relative newcomers as Big 5 head coaches. Villanova’s Jay Wright is now the elder statesman, but Wright has taken his program into another stratosphere, ironically finding new life in the newly basketball-centric Big East. The Wildcats have won two national titles in the last three years, capitalizing by recruiting that next tier of great players after the Dukes and Kentuckys and North Carolinas had finished picking through the entire country’s elite one-and-dones. The ripple effect seems to have knocked Saint Joe’s down a peg. Since ’04, the Hawks have made it back to the tournament just three times. In the last three years, Saint Joe’s failed to register a winning season. Winning is the bottom line, but it’s hard not to think that, in a bygone era, Dunphy and Martelli might have been better able to choreograph their endings. Dunphy was asked to leave last year; he reportedly only agreed to stay another season on the condition that Aaron McKie, a Temple legend and one of his assistants, got to succeed him. Martelli’s days were probably numbered after Saint Joe’s longtime athletic director retired last spring. In the end, Martelli’s dismissal was announced in a bloodless press release. “I thought I was a part of the fabric of the place,” Martelli told The Athletic’s Dana O’Neil soon after the news broke. “And I thought the place was a part of my fabric.” With that, what once was local was truly national now.